In Hong Kong, there are 26 species of bats. Some station in the city parks. When the sun sets and birds return to their nests, bats leave their homes and prowl in the night. 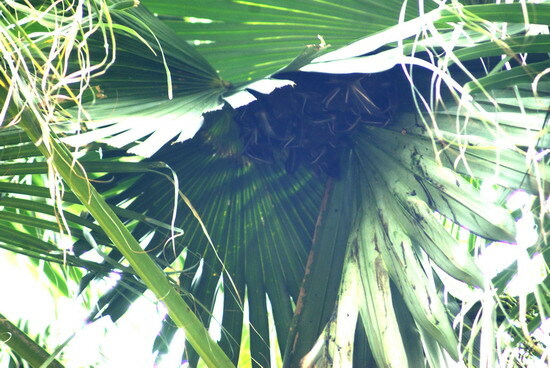 This time, I would like to introduce Short-nosed fruit bat which lives in amongst the fronds of Chinese Fan Palm near Haiphong Road entrance in Kowloon Park. There are also a few Common red stem (Ficus variegata var. chlorocarpa) near by. 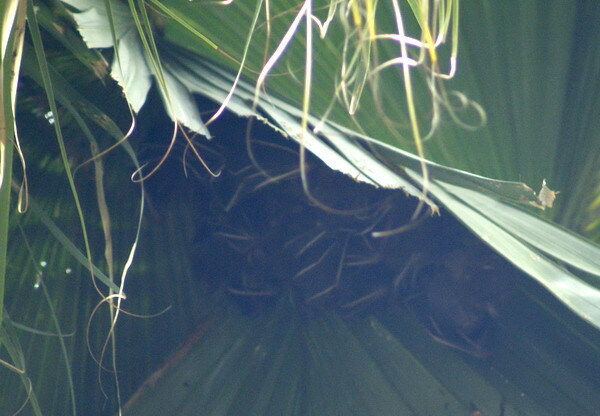 The bats make use of the Fan palm fronds to build a tent nest. Its food is the fruit of Common red stem. Living in urban areas without asking more than two meals a day and a place to live is not too difficult. No wonder it is commonly found. 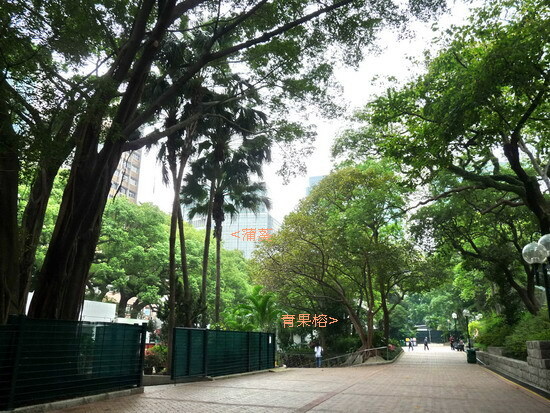 The bat habitat of Chinese Fan Palm plus Ficus trees is quite common in parks. If you pay more attention, you will find bats in the parks nearby. Chinese always take “bat” as “blessing” (the same pronunciation) and, therefore, are happy to have bats in the neighborhood. Some other favorite plants of Fruit Bat are: fruit of Chinaberry (Melia azedarach), flowers of African tulip tree (Spathodea campanulata), flowers of Birdwood’s mucuna (Mucuna birdwoodiana), flowers of Banana (Musa spp. ), fruit of Banyan (Ficus spp. ).